As part of HubSpot’s GDPR compliance efforts, we have added an additional requirement for partner lead registration. This will impact any partner who enables the GDPR toggle AND is using workflows or full sync to register leads. Check out our brand new GDPR playbook here. Starting May 25, there will be an additional required field to partner lead registration (see screenshot) for any partner who has enabled the GDPR toggle located under Settings > Account Defaults. Under the GDPR, you need to have a legal reason (called a lawful basis of processing in the regulation) to use someone’s data. 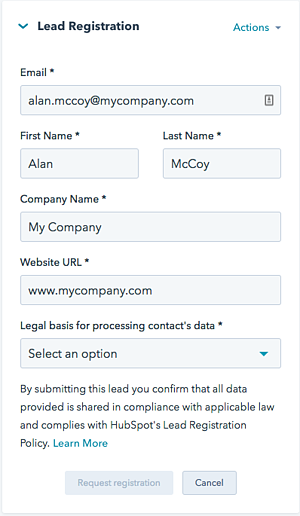 This new field establishes your lawful basis to process the lead’s data. Any partner who enables the GDPR toggle AND is using workflows or full sync to register leads will begin to see their registration requests fail if they do not include this additional field in their forms or workflows. As always, you can find these and all other GDPR resources for partners in the GDPR section on the Partner Product Resources Page.